Sidney Police Officer Nick Zimmer practices with SPD’s newest K-9 Officer Kash, who is a 17-month-old German Shepherd, at the Shelby Public Transit garage in November. Kash and Zimmer, his handler, have been partners since Aug. 10 when Kash arrived from Germany. SPD’s newest K-9 Officer Kash, who is a 17-month-old German Shepherd, waits on his handler Sidney Police Officer Nick Zimmer while training in the Shelby Public Transit garage in November. Kash and Zimmer have been partners since Aug. 10 when Kash arrived from Germany. SIDNEY — Sidney Police Department’s (SPD) K-9 team gained a new member this fall with the addition of K-9 Officer Kash. Kash, who is a 17-month-old German Shepherd, and his handler Officer Nick Zimmer have been partners since Friday, Aug. 10, when Kash arrived from Germany. The two went through training at Von Der Haus Gill German Shepherds Inc., which is owned by Master Trainer Al Gill, of Wapakoneta. Zimmer and Kash officially began patrol together in October after six and a half weeks of training. Kash, who lives with the Zimmer family, is with Zimmer basically 24-hours a day, whether in his cage at home, on patrol and training at work, or in his specially adapted transport kennel in the rear of Zimmer’s police cruiser. Kash joins K-9 Kilo on the force. Kilo’s handler is Officer Jim Jennings. Kilo has been with the department for going on three years come February. Kash filled the open position after K-9 Duke retired in August. In retirement, Duke continues to live with his handler, Officer Rodney Robbins. 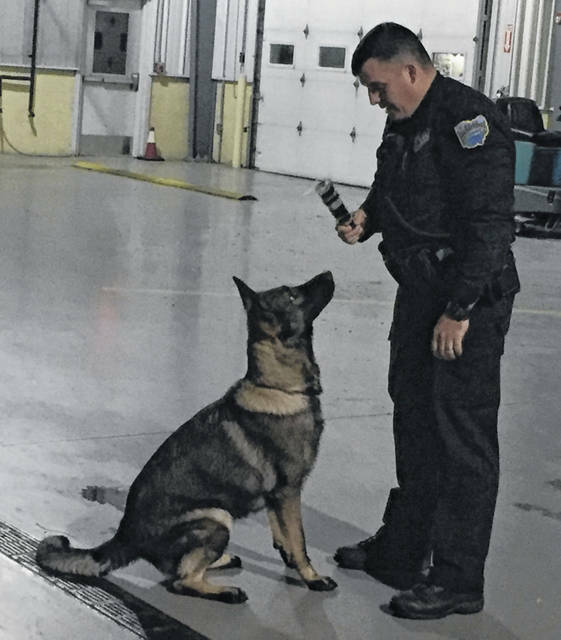 Zimmer, who has been with the SPD for five and half years, made his desire to become a K-9 handler known within his first year on the job. Zimmer said during that earlier time with the department, the SPD only had one K-9 (Duke) on third shift and knew they needed another. Although he understood he was not eligible to become a K-9 handler, since an officer must be with department for at least three years, he took initiative to conduct research to help find funds to purchase another K-9. Zimmer then presented his ideas to Police Chief Will Balling. “I researched and came up with a budget and came up with some ideas, some of which were against the city’s policy — every city has a different policy — so, some of them weren’t able to be used, but I knew the chief used some of the ideas for money, and he also budgeted for a second dog,” Zimmer said. Kilo was later added from grant funds and the help of donations from Shelby County AAA, Hubbard Feeds from Botkins, Shelby County United Way, Walmart, Cargill and Wilson Health. The next K-9 handler for the second dog, Kilo, was Jennings. “He rightfully deserved (to get Kilo). He wanted the dog, and deserves it, and has done well with Kilo,” Zimmer said. Zimmer said after Jennings and Kilo came to his shift, on second, he said he used them all of the time. “A lot of what I do is based around drug arrests, so I called them in from off-duty more often than anybody else called them while on-duty or off-duty,” Zimmer said. 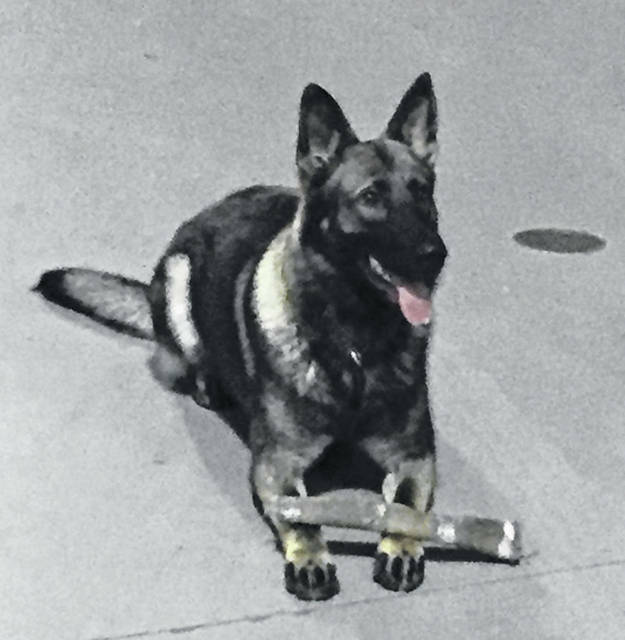 Using Jennings and Kilo, being one of the top three officers for drug arrests and likely showing interest during his first year with the department, Zimmer said, probably help helped him to become the next K-9 handler after Duke’s retirement. Balling said no donations were used to obtain Kash. The cost of more than $15,000, for Kash, including training, and equipment, was fully funded from the city’s general budget. With Duke’s pending retirement, Zimmer learned he would be the next handler in the spring. Balling said Kash was needed because they like to have two K-9 units with the department to spread over a 16-hour span. Kash has several duties, including tracking, narcotic detection, building/article searches, evidence searches and apprehensions. As of the end of November, Kash had been used 20 times to conduct three tracks and a couple of building searches during his first month in a half on the job. Zimmer hopes to work as a team with Kash for 10 years. Kash is certified member of the department. If someone tries to harm a K-9, the person will face criminal charges. Currently Kash and Zimmer work from 7 p.m. to 3 a.m.